We are a volunteer based club which enables us to have the resources and training that you enjoy. Members must take the time to maintain our fleet, train others to safely enjoy this amazing sport and volunteer in Locarno events. The more involved you become, the more enjoyment and personal rewards you get back. You'll always be guaranteed a fun experience. That is how Locarno is able to offer all it does at such a low cost. You are part of a well-organized and dedicated team of passionate sailors who want everyone to have the opportunity to enjoy the ocean. KEEP THE EQUIPMENT LOCKED AT ALL TIMES! DOUBLE CHECK BEFORE YOU LEAVE THAT BOARD IS AWAY and SAIL IS HUNG AND LOCKED! HARNESS AND LIFEJACKET IS AWAY! FULL NAME IS USED ON GEAR SIGN OUT SO LOCARNO KNOWS WHO TO SPEAK TO AFTERWARDS. It is amazing how many times a board or a complete rig is left on the beach or even on a cleaning rack 2 feet from the door! Did you have an accident? Locarno doesn't know! Who do we telephone? Who do we send the coast guard to rescue? Who is responsible for that sail that flew off and hurt someone on the beach or that board that was stolen as someone didn't lock it up? DOUBLE CHECK before you leave and never-ever leave another in charge of locking up your signed out gear as last person signed out is the last person considered using that gear. Our freight container for the boards and rentals, when open, allows the public to see what we have - minimize their view as much as possible! No Beaching (sailing the board on the beach!) When approaching the beach, slow down and lower the sail well before the centerboard or fin hits the bottom. Boards are delicate; centerboards and fins will break and chip. For the same reason, don't drag boards along the beach - always carry them. Boards & sails should only be set down on sand, grass or carpeting-not bare concrete or rocks. Do not leave board and sail lying in the surf; they may be damaged and will assuredly become clogged with sand. THE THREE - Docks, Rocks and low tide pilings - BE AWARE. Sail : Ensure that your sail is thoroughly cleaned with fresh water, including the luff (mast) sleeve and mast foot, before hanging them on the racks. Make sure all sand is rinsed out of board's mast track. Check for easy movement once cleaned. Lock the sail using the combination lock. Board : Place your board on the rack in the rinsing area, and hose it down with fresh water. 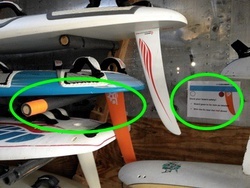 Carefully, carry the board to the windsurfing container, and place it in the designated rack. Get help if the board is too heavy, or you are exhausted. Accessories : Rinse your harness and PFD with fresh water. The easiest way is to submerge it in the barrel of water that is beside the fence. Hang the harness and PFD back inside the windsurfing container. Also, tidy up wherever needed. There is a broom in the container, which you can use to sweep out the sand and debris that gets trekked into the container. Make sure to leave enough time after sailing to store the equipment away correctly. The Locarno pre-rigged sails are stored in the rack, adjacent (East) to the windsurfing container. The racks are identified with the LOCARNO logo. 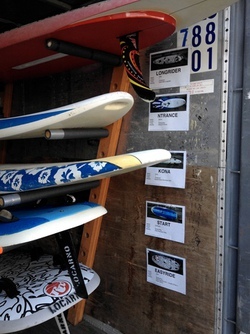 All boards are stored in the windsurfing container. PFDs, unrigged equipment, and tools are stored in the container also. Please return everything back to where it came from. Look for identifying labels and signs. Keep gear organized. Sails and other gear are only to be rigged/de-rigged on the GRASS or on the RIGGING MATS PROVIDED! Sails that must be rigged are only for advanced, level 3 sailors - most sailors will only use the pre-rigged equipment. Never sail right up to the shore, drop your sail in chest high water and once again balancing the sail and board by grabbing the boom and footstraps, lift everything onto the beach, ensuring nothing is dragged on rocks and the sail is safely away from the surge. Bring the sail in first and hose it down thoroughly at the rigging area. Make sure all sand is cleared from mast and mast sleeve. Hang the sail up in the designated spot. You will note that the sail hangers have the sail size written beside the hook, please follow this as different sails require different size hangers. Level 2 and Level 1 both have their smaller sails hanging Northward and the largest sails southward. Finally, lock it up and make sure the tarp sheet is secured. This tarp at the front of the shed protects the sails from sunlight and hence, ensures they last longer. Take a final look to see if all is hung correctly, please re-lock, re-hang sails, whatever is needed. Locarno thanks you. Go back get your board, carrying as instructed earlier on, and store with the nose first IN THE BOARD SLOT you originally found it. 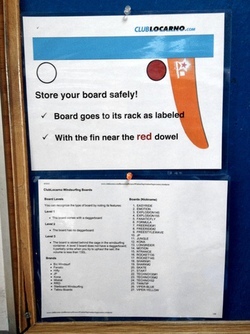 There should be tags to direct you to where each board should be stored. This is done as some boards have long fins and need a higher resting place, some are too heavy to safely lift to the upper racks, etc. I almost always ask for help at this point as I'm usually exhausted from the sail. Finally, double check and make sure the fin isn't scratching another board. Rinse off your lifejacket and harness and immediately place back onto the hangers where you found them in the back of the board shed. Sign your gear back in. Very important as this information is tallied at the end of the year and assists with gear purchase and/or sales.